What is DarwinIA and Who Can Participate? DarwinIA is a monthly challenge which invests in the 60 top ranking DARWINs at the end of each month. DarwinIA is a monthly challenge which invests in the 60 top ranking DARWINs at the end of each month. It is a way of incentivising traders to improve their trading. It is important to note that DarwinIA is NOT a investment recommendation. Each month a maximum of €4,500,000 is allocated to the top 60 DARWINs on the leaderboard. The allocation is a multiple of the smallest equity realized during the competition on the DARWIN’s underlying trading account, and is capped to a maximum by leaderboard rank. These funds remain invested in the DARWIN for a six month uninterrupted period. This means that Darwinex maintains a maximum of 27,000,000 € notional investment in its own traders. From the profits generated by the DARWIN with the invested funds, the trader obtains a 20% performance fee (calculated on a quarterly basis, taking into account a high-water mark). In addition, Darwinex hands out cash prizes by means of dividends thanks to DWC, the first indicator of the community sentiment created by DarwinexLabs. Who can participate in DarwinIA? Let's look at how we can participate in our monthly challenge and what are the criteria which determine the ranking. All DARWINs are automatically entered into DarwinIA. Monthly Divergence. Those DARWINs with a monthly divergence equal to or less than -0.5% are excluded unless their AuM is under 2000 $. Correlation between DARWINs from the same provider. If the same trader has two DARWINs with a correlation above 0.5, only the DARWIN will the higher D-Score will participate. Correlation between DARWINs from different providers. If two different traders have DARWINs with a correlation above 0.8, only the DARWIN will the higher D-Score will participate. D-Score. It is a weighted average of the scores obtained by the DARWIN across the 12 Investable Attributes. Darwin's Return. Measures the monthly return achieved by the DARWIN. Regularity. Compares the DARWIN's activity for the current month compared with its activity over the previous three months. Due to the high level of some of the traders within our community, competing for investor capital in Darwinex is no easy task. The DarwinIA challenge offers a great opportunity to generate extra income from your talent as a trader. Thanks to this challenge, some of the best traders in our community are managing amounts close to, or above, 500,000 EUR! We even see DARWINs which manage a much higher amount from DarwinIA than what they manage from private investors' capital. These are some of the most frequently asked questions from our users. Does Darwinex hand out 4,500,000 € in prizes? 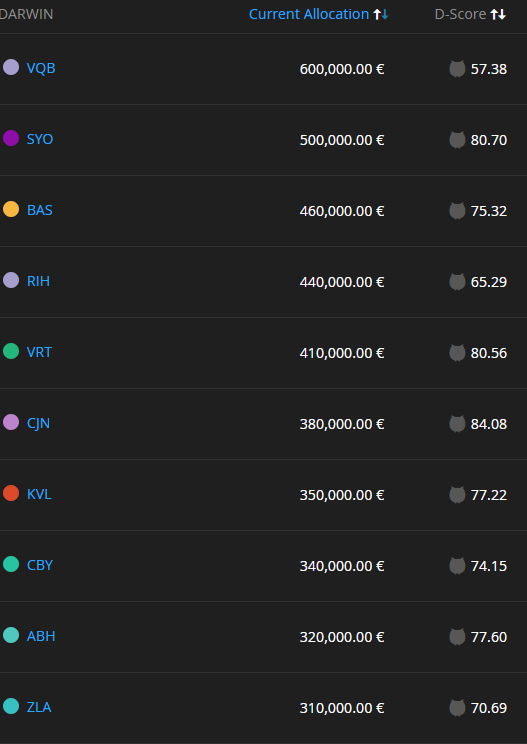 As shown above, Darwinex does not hand out 4,500,000 € in prizes, but rather it invests that amount in the top ranking 60 DARWINs at the end of the month in question. In terms of the return generated by the different DARWINs we have invested in, Darwinex will pay the 20% Performance Fee. That said, and as we have mentioned beforehand, Darwinex will hand out Darwinian Dividends based on the DARWIN DWC's Performance Fees, provided that these criteria have been fulfilled. How often is the DarwinIA ranking updated? The DarwinIA ranking is updated every 4 hours. On the DarwinIA page it states the time remaining for the next update. What can I do if my DARWIN has been disqualified due to correlation? The correlation between the different DARWINs varies and, although at one given point in time you can be excluded from the contest by a trader, it could well be that after the next update you are included again. It is true that strategies which are self-developed will have less chances of correlation than commercial robots which are widely used, even if these have been optimised with different parameters. Do I have to trade a certain number of times to have 100% regularity? We measure the monthly regularity in terms of your activity over the last three months, which means that there is not a certain number of trades required to participate in DarwinIA. The only thing to bear in mind is that there is a degree of consistency in terms of the number of positions closed and their duration in the current month, and the average over the last three months. We are aware that algorithmic traders will have a much higher number of trades than manual traders, that said everybody can reach 100% regularity trading with a consistent frequency in their trading. If you want to learn more about DarwinIA, Darwinex CEO Juan Colón explains everything in great detail in the following webinar.